BACKGROUND: About 20% of patients with colorectal carcinoma present with acute obstruction requiring emergency treatment. Emergency surgery for obstruction is associated with high operation risks and creation of a stoma is usually necessary. Endoscopic colonic stent insertion can effectively decompress the obstructed colon, allowing bowel preparation and elective resection. Laparoscopic resection is also possible after decompression with colonic stent. METHODS: Surgical resection was performed after stent insertion for colorectal obstruction for malignant cancer in 32 patients. A total of 18 patients were treated with open resection, and 14 underwent a laparoscopic resection. 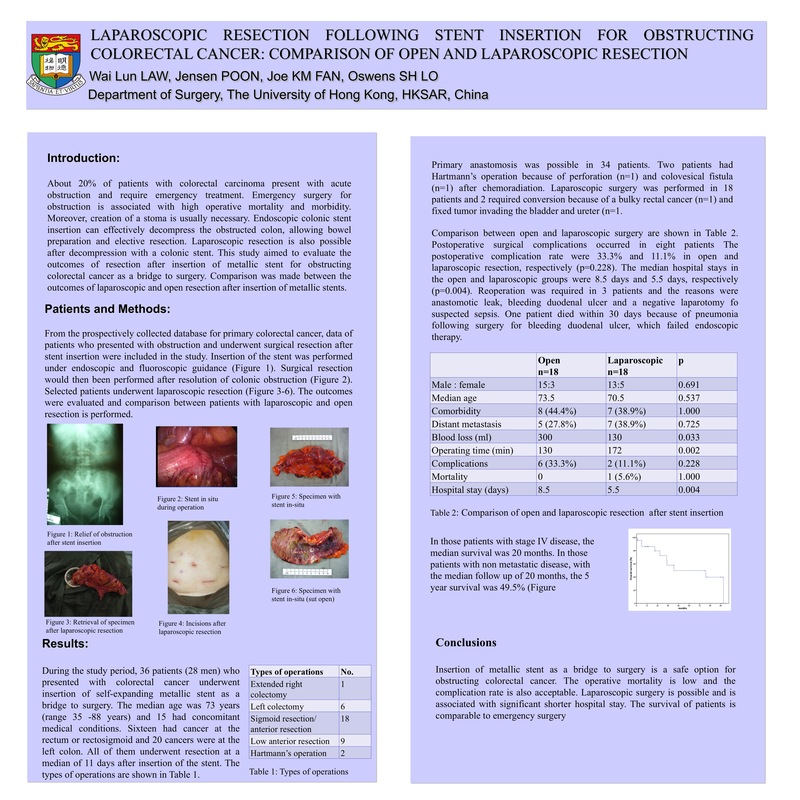 Comparison was made between patients with laparoscopic and open resection. RESULTS: Thirty-two (24 males) with a median age of 71.5 years underwent colorectal resection with prior metallic stent insertion for malignancy obstruction. Fourteen patients underwent laparoscopic resection while 18 patients had open surgery. There were no differences in the age, gender, and duration to surgery between the two groups. Two patients in the laparoscopic groups required conversion to operations. Three patients in the open groups required Hartmann’s operation and all other patients could have primary anastomosis. One patient in the laparoscopic group died after the operation because of pneumonia and bleeding peptic ulcer. There were no differences in mortality or morbidity between laparoscopic and open groups. However, patients with laparoscopic resection had significantly less blood loss (150ml vs. and 300 ml, p<0.05) and shorter hospital stay (6.5 days vs. 9 days, p<0.05). CONCLUSION: This study shows that after successful endoscopic stenting of malignant colorectal obstruction, elective surgical resection can be performed safely. Laparoscopic approach can been performed and the outcome is better than open resecton. The combined endoscopic and laparoscopic procedures are a less invasive alternative to the multistage open operations and offer a faster recovery.